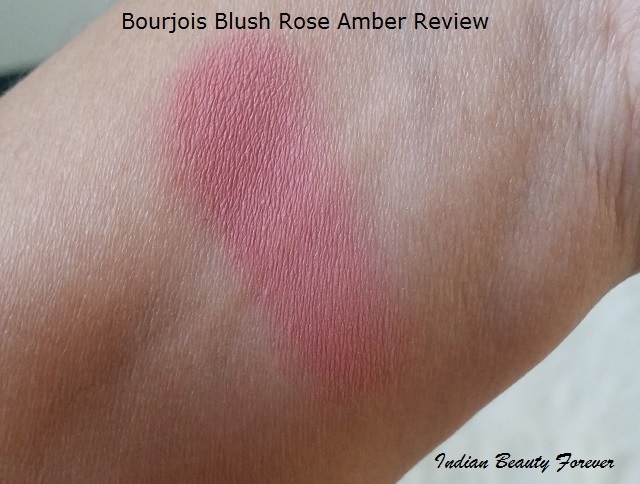 Today, I am sharing with you one of my favourite blush’s review which is from Bourjois in the shade Ambre Rose. I have shown you this in my haul, if you remember. 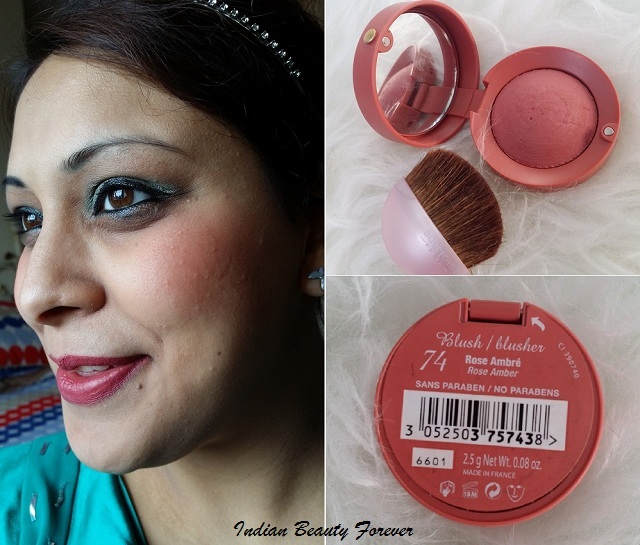 Price: Bourjois Blushers are priced at 710 rupees in India and are available in more than 15 shades. How to Use: For a natural result, smile and apply the blush on your cheekbones with circular movements. Then stretch up to the temples. If you applied to much, don’t worry; just apply a coat of powder on top of it. 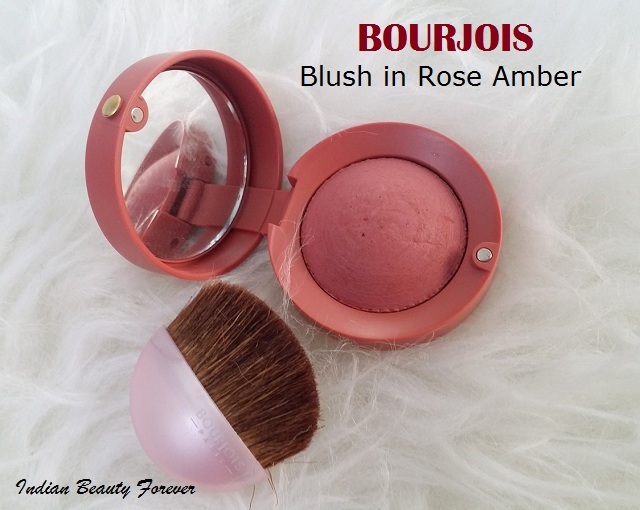 Brand claims: Bourjois Little Round Pot Blusher Powder is soft and velvety thanks to a pearl effect and a skilful blend of pigments. 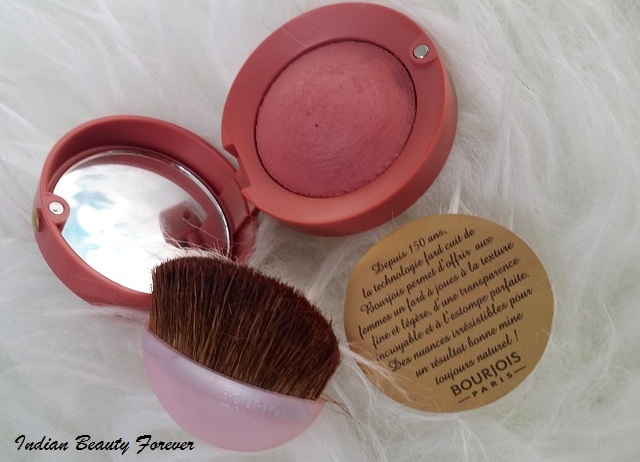 Our timeless blusher has been around for almost 150 years and has made Bourjois famous worldwide thanks to its amazing texture and packaging. One stroke of the brush reveals the irresistible aroma of the rose scented powder. Its built-in mirror and brush is perfect for touch-ups on the go! Packaging: I love the packaging. A cute round pot which has a magnetic lock. It is very sturdy, compact and travel friendly. 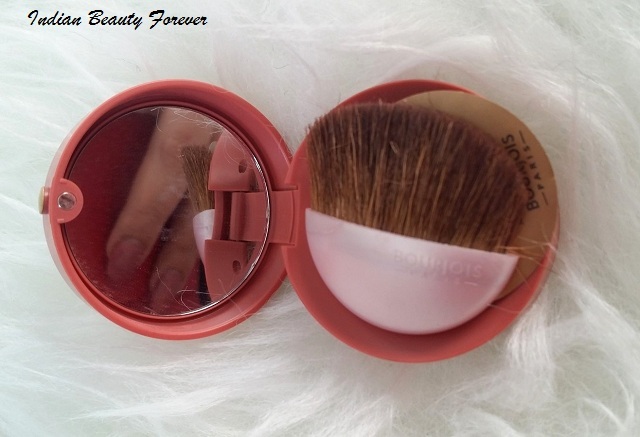 The lid has mirror inside which looks very classy and it has a cute brush which I have used that works fine. I like the bristles of the brush as they are not harsh on the skin. The shade name and number is written on the back of the pot. My Views: Rose Ambre, is a very pretty coral pink colour which gives natural glow to the cheeks and brightens the face .The collection has more than 15 shades to choose. Lasting power is amazing. It stays more than 8 hours. It blends in to skin effortlessly. 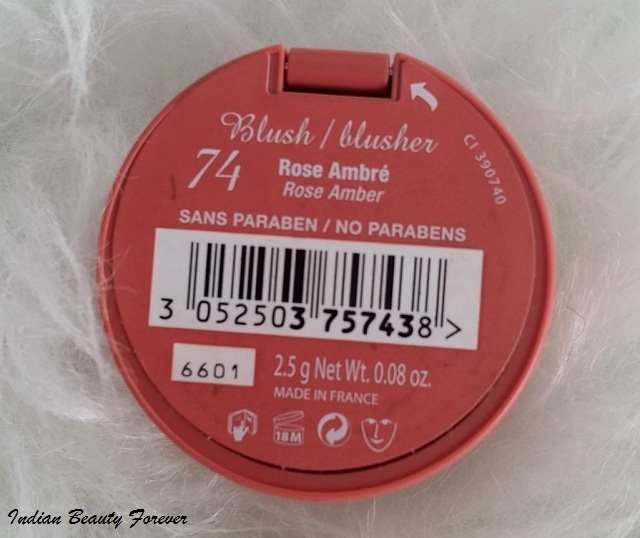 Blush has a strong smell but I liked it, may be problem for some people but not for me. The smell vanishes once applied. 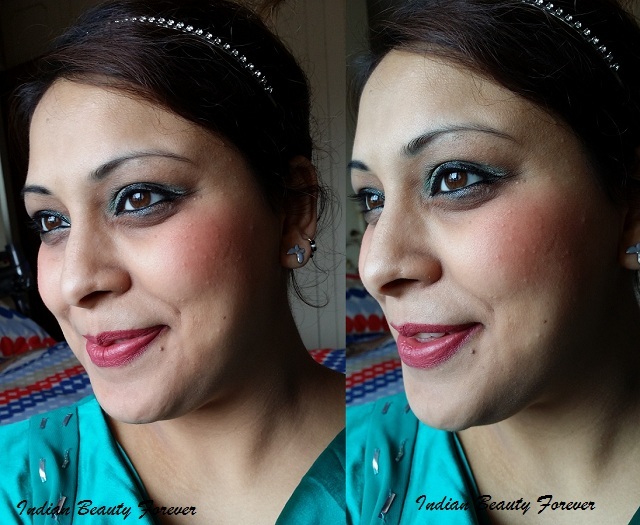 It is matte powdery in texture which does not fallout while applying and do not have shimmer in it. 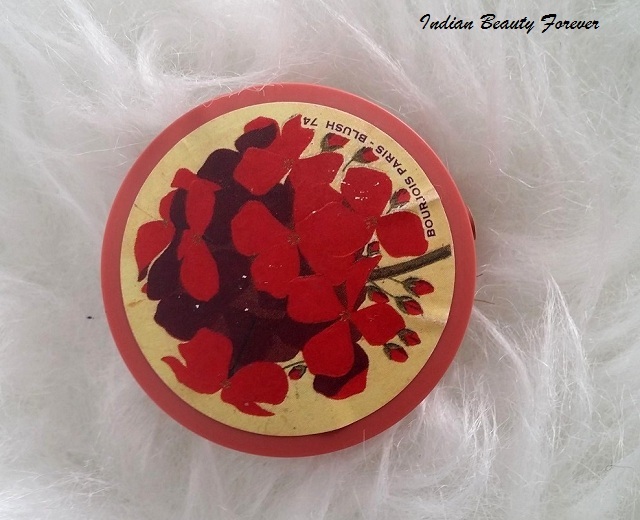 The pigmentation is superb as one or two swipes are enough to build up the colour and with one swipe it can pick up a decent amount of product to give a nice rosy touch to the cheeks. It would suit medium to fair skin tones. It will suit to oily skin beauties as well and is going to last at least 5 hours on their skin too. 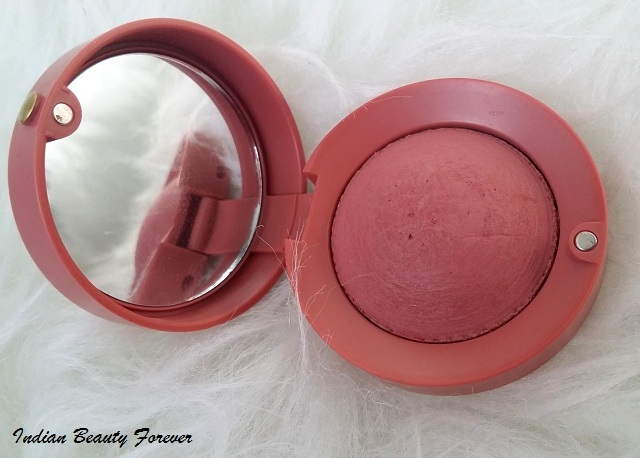 Final Verdict: For Pink coral Lovers this Blush is absolutely must have. A cue little brush included is very handy. Packaging is compact and you can easily take with you while traveling. Colour stays longer on my cheeks at least 7-8 hours. 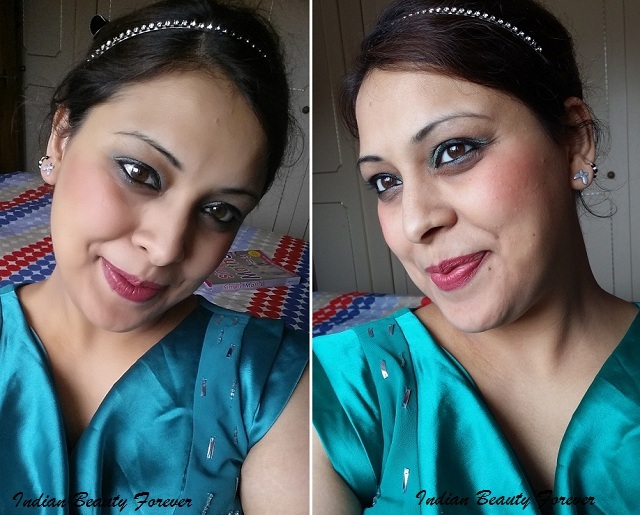 It gives a healthy n glamorous glow to overall face and can get it easily from Boots, Amazon or Superdrug stores!